DIY (swine?) board and batten walls! UPDATE: This bathroom is now finished! Want to see how it all turned out? Make sure you check it out here in the bathroom reveal! We made a little bit more progress on our bathroom updates with our Home Depot gift card! Yipee! We are super slow but at least we eventually do make progress. Before I talk about the kids’ bathroom, you might remember I shared about some of the things from Home Depot that we are going to put in our powder room. Last weekend we also bought an awesome tilt mirror like this from Home Depot for that same bathroom! 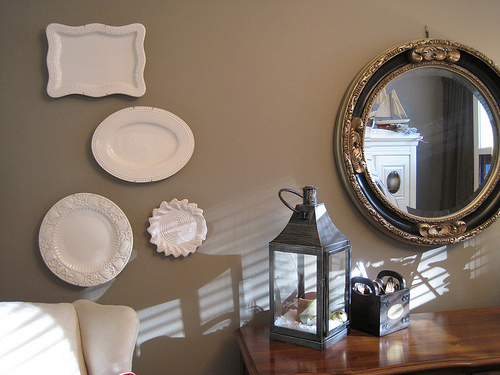 I love that mirror, it is so simple but classic! And then sadly (and I think this is one of those Murphy’s Law things) about two weeks ago our master bathroom toilet stopped flushing, so we have been looking into the possibility of needing a new toilet. Just so we can be working on three bathrooms at once. Meanwhile though, back to the kids’ bathroom, we are making slow but sure progress! Yes, the wall color is bright. Don’t adjust your monitor. It is bright. But I’m going to balance it out a bit with the accessories so I’m not too worried about it at this point. Plus, it is a generally dark kids’ bathroom so having a little zing and happiness on the walls in here is going to be fabulous. And yes, all the woodwork looks … pink (um, yeah, more SWINE). Because clearly our contractor was in touch with his feminine side when he picked all the paint for this house. Grrr. Must fix that. What have I done so far in this room? So far I have painted the walls, the ceiling (this was prior to my new ladder, so I painted it perched on a chair) and we started in on the board and batten! Oh, and I changed the cabinet hardware . Board and batten the easy way. To be honest, I was really nervous about doing a board & batten project (our old houses came with them already done, I’m not used to having to ADD so much character to our walls) but I went to my new favorite hangout, Home Depot, with my measurements and they were super helpful. They cut all the battens for me. I used 2 inch mdf battens that were already primed, so it was super easy, no need to cut, saw, sand or prime or anything. YES! Just glue and nail. You can nail the battens up without a nail gun. We don’t own a nail gun, but my hubby has a nail tapper thing (not sure what it is called) so it was not hard at all to nail up the battens the old fashioned way — with a hammer and nails. You just use the tapper thing to sink the nails into the wood so you can’t see them. It really wasn’t hard at all. The only hard part is making sure that all the measuring is done and everything is level and equal. I’m kind of picky about that! We did use some Liquid Nails on the battens first. Yes, that might be cheating. I’m also not a real fan of mdf, but it is affordable and easy to work with so that is what we went with this time! I painted the ceiling too! The swine woodwork is going to drive me crazy. I have to go back to Home Depot to get another chunk of mdf for the top piece of molding in the corner by the door. EW! This side of the room is pure chaos to my eyes. I can barely look at it. Half swine, half blue and LOTS of mess. BAH! That combo pretty much makes me nauseous! I haven’t decided yet if I’ll continue the board and batten around the cabinet walls or not. I need to rip off the “side/back splash” and do a little bit of work to cut the battens around the counter, but it could be done if I decide to go that route. UPDATE! Want to see what we did with that side of the wall? 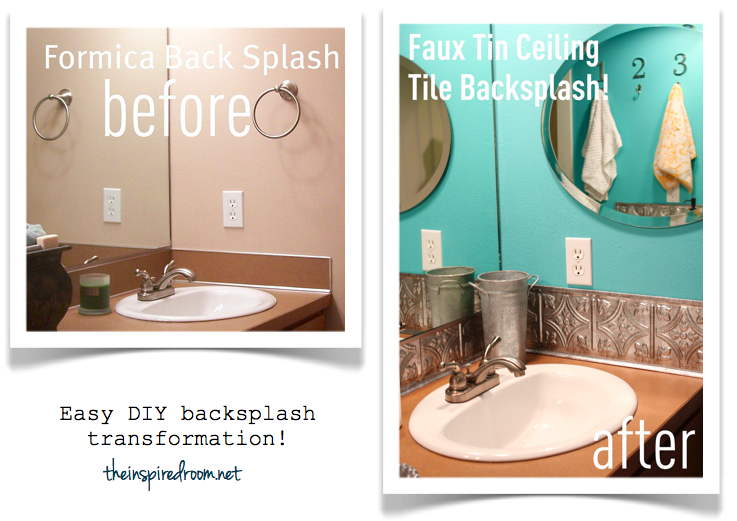 The step by step backsplash can be found in my faux tin ceiling tile back splash tutorial! Annnnnnd, more swine walls that need to be painted. I have been debating what color to paint this little adjoining toilet/shower room, but after seeing how bright the blue is in the other side of the room (even though I love the color), I think I’ll paint this little room a pleasant shade of white to keep things from being TOO BLUE. See the swine? It.never.ends, I’m telling you. Swine is going to be the death of me. This is where I reveal that I am a dork…. When I posted about the blue color of this bathroom, I actually told you all THE WRONG COLOR! But you know how when you have a million samples of blue strewn about and they all kind of look the same and your mind fogs over and you can’t even remember your name let alone the name of the paint samples? And then you grab one that looks like it and like a crazy woman you write a whole post about that color? Long story short, I gave out the wrong paint color. The one I mentioned was a lovely one, though, so those of you who went out to buy it (yes, I did hear from people who did that!) I’m sure hope you will love it. Gah, so sorry! This wall paint is actually called Lagoon by Martha Stewart. You can find the paint at Home Depot, where all of my supplies have come from so far for this project! And now I duck my head and promise to always double check my paint can before I talk about my paint colors. A great big thank you to HOME DEPOT for the gift card to help us get started on these fun bathroom projects! More progress reports to come! Hopefully things will start coming together! 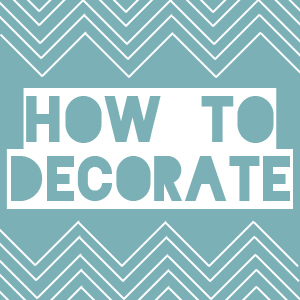 Do you need tips for how to decorate, no matter what your style or budget is? Do you need some fresh inspiration for ways to decorate your home? 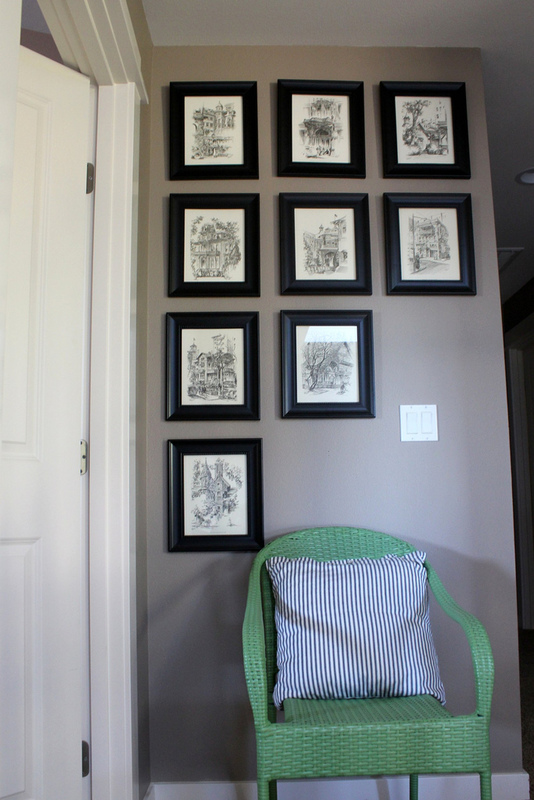 I’ve written TONS of posts over the years on how to decorate and find inspiration for your home. So to help you navigate, I’ve created a gallery of decorating ideas and a list of my favorite tips which I think will be very helpful! This Decorating 101 series will provide you with endless affordable and simple ideas for your home. Below is the gallery of posts to inspire you with the types of tips, ideas and decorating inspiration you are looking for. Simply click on any of the boxes below in the inspiration gallery and then scroll through the related posts to be inspired for how to decorate. 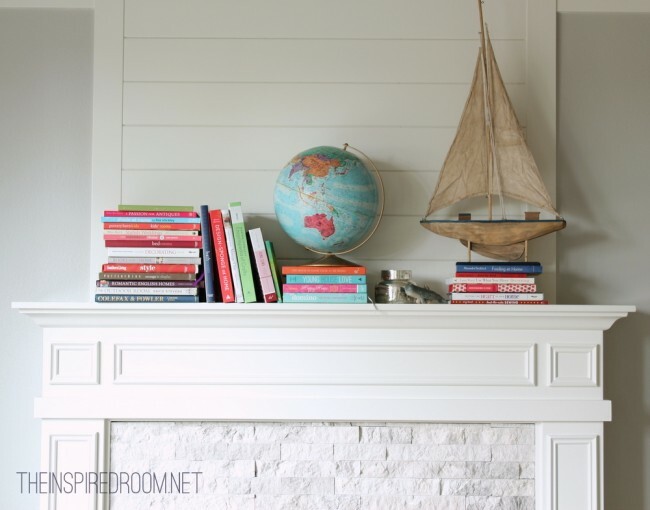 Following the decorating inspiration gallery, you’ll find a list of links to simple decorating tricks and topics. Because I believe everyone deserves a lovely home, here are some links to affordable, doable and practical principles I use to decorate my own home! I find new things at thrift stores and flea markets. I think of creative ideas for what to hang on walls. I set trends by having happy decorating accidents. I do my own simple DIY projects. I find a magazine photo of a room or idea I like and I recreate it using what I have. I lean & layer artwork and mirrors. I make my own simple DIY wallpaper out of heavy paper or gift wrap! I get brave and paint furniture I already have. I customize beautiful fabric on sale for curtains. 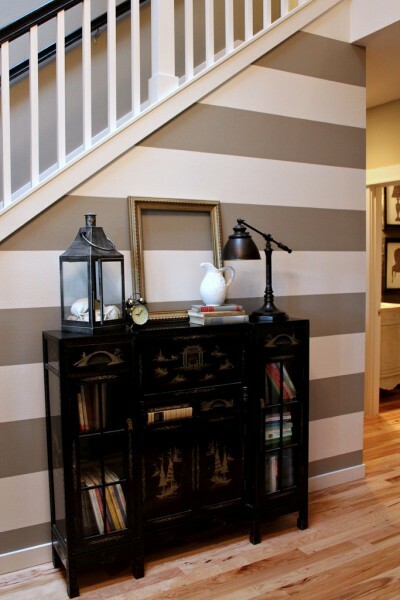 I add paint stripes on walls. I create an inspiration board. I create antiques with character out of unfinished or blah furniture! If I’m feeling like I am losing my style direction, I create a Progress Report! I’m always tweaking things, my house is never done. I love adding personality through charming architecture. I re-arrange furniture to make our home work better for us. I like to use natural materials to make my home feel warm. I love to incorporate the seasons. I like to add some whimsy! I like neutrals and pops of color. I reuse and recycle classic decor items and fabric. I creatively conceal things I don’t like! I like to establish a purpose and focal point. I determine when something is GOOD ENOUGH. I go to the Goodwill and find treasures to spray paint! I create art out of book pages! I use an element of surprise. I make our home feel like US. I stalk my favorite stores like Anthropologie for inspiration. I find ideas for styling my tables and shelves in the Pottery Barn catalog. I decorate with useful and practical things.